Weekend mornings are so much more appreciated now that school is back in session. Somehow waking up after the sun has broken the horizon feels much more agreeable than waking in complete darkness. With less of an agenda on these leisurely weekend mornings, extra attention is given to our first meal of the day, and making breakfast together becomes a special time. Since discovering how easy it is to make strawberry crepes, these little fruit wraps have been oft requested by Liv. Today's request though, found us without strawberries! What to do? A perusal of the fruit basket showed watermelon or 4 perfectly ripe peaches and one beautiful white nectarine. Not much of a choice! Out came the cutting board and we soon had a bowl of perfectly sliced, fragrant, juicy peaches. Hoping for a peach pie-like flavor and texture, we warmed a little butter in a pan, added brown sugar, cinnamon and a touch of nutmeg. Once the sugar had begun to melt we added the peaches and simmered until they were somewhat soft, but not mushy - about 6 minutes. Off of the heat we drizzled in a bit of our favorite Tahitian vanilla and were set to fill our lightly browned crepes. Fragrant cinnamon and peaches filled the house with a tantalizing aroma... beautiful enough to drag a sleepy 14 year old boy from the depths of sleep wondering what was for breakfast, a definite sign that we had done well! This recipe takes a good amount of ripe peaches and would be a perfect complement to a nice vanilla ice cream if you have leftovers... which I'm thinking you won't! Mom's crepes sans powdered sugar! Note - the crepe batter recipe will make at least 10 crepes. Combine the crepe ingredients in a bowl (eggs through salt) and whisk thoroughly to mix, making sure there are no lumps in the batter (will take a full minute or so!). Set aside and let rest for approximately 1/2 hour. Melt the butter in a skillet over medium heat. When almost melted add the brown sugar, cinnamon, nutmeg and pinch of salt. Stir until the sugar is almost melted, then add the peaches and/or nectarines. If the sauce is too thick add a tablespoon or two of water to desired consistency. Stir in vanilla. Simmer the peaches for 6 or 7 minutes, or until soft but not mushy. Remove from heat. Heat a small non stick skillet over medium heat and spray with cooking spray. Using a small ladle, pour 3-4 tablespoons of the batter into the hot pan. Tilt the pan so that the batter spreads a thin layer evenly over the bottom. Cook for 30 seconds to 1 minute per side, then carefully flip the crepe and cook for another 30 seconds to one minute. 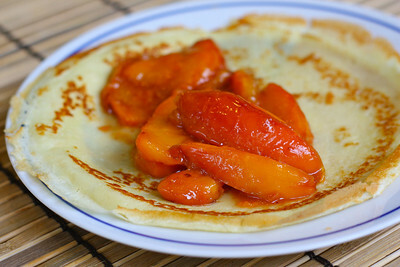 Remove the cooked crepe, place on plate and fill with the peach filling. 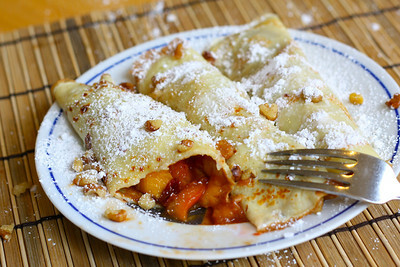 Roll crepe and top with powdered sugar and chopped walnuts. Note: Sauce may be doubled for a thicker, richer sauce! This fragrance would have woken me up too! But I agree waking (a little later) in the light sure beats the dark and early mornings any day. Those peaches look so sweet and juicy. SO perfect for crepes! I can smell those over at my house! Wish we were neighbors! Everyone in my family adores crepes. The peach filling sounds divine! These look absolutely fabulous! 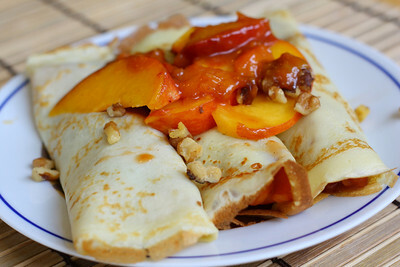 I love peaches and nectaries, and I love crapes too! Yum! Totally agree on weekend mornings and weekend breakfast. I look forward to having breakfast with no hurry. 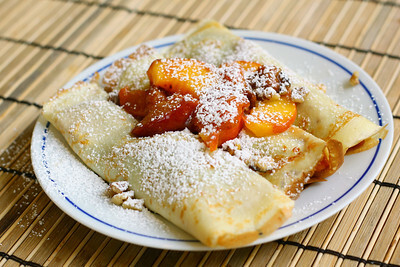 And these peach crepes sound like a wonderful treat for a joyful breakfast. Pictures are gorgeous too! These are a lovely treat for breakfast! And I like the sound of the peaches with ice cream too. I almost thought I could smell them when you were describing them. Thank you for the sweet and supportive comments you left me! I've never made a crepe. I will have to try these! My husband won't eat peaches...blasphemy, I know! Think I could sub in apples and get the same basic effect? Gosh I can almost smell them! Peach in crepes? Two thumbs up! I'm coming over next time you make these! I know peaches are in season and there are a lot at a market! Peach crepes are a great breakfast to wake up to! What a feast! On another note, I appreciate your advice about doggies :) It's fun talking about them. My friend and I are always talking about our dogs just like parents talking about kids! Yes chocolate is toxic to dogs. Milk choc is okay but semi sweet, dark, or unsweetened are really bad. The baker's brand is the worst for dogs. Can you believe that? I'm going to make these when my in-laws visit!! Gorgeous! All these peach recipes floating around make me feel like I'll miss them even more when they're done for the season! I've always been scared to make crepes...maybe it's time to try. Now, that's a breakfast I wouldn't mind waking up to! Sounds delicious! I just bought some South Carolina mountain peaches yesterday. They just may need to get hugged by some crepes tomorrow! Thanks for the great recipe.